I turned 27, and no, I am still not an expert at life (is anyone, really?) but I have learned a few life lessons that I wasn’t entirely aware of in my teen years that I wish I had known. I wanted to share them, in case any of these resonated with some of your own life lessons. Let me know in the comments what’s one thing you’ve learned in your life that you didn’t grasp when you were a teenager? Let me know in the comments what’s one thing you’ve learned in your life that you didn’t grasp when you were a teenager? 1. Energy is real, and it’s important. The energy we surround ourselves with every day is something to take note on. The energy we put out into the world with our thoughts will come to us. So be positive and surround yourself with positive, good, cleansing and healing energy and remove yourself from situations where you feel your energy being sucked out. Being self conscious, having body image issues, feeling less then, or being insecure all lead to very many different ways of taking a compliment. Do you compliment back, do you believe they are just telling you that because they feel like they need to. Do you look down in the dumps and that’s why they said something nice to you? The amount of damaging thoughts we have sometimes it’s unreal. Just say “Thank you”. 3. Enjoy the time with your loved ones. People go unexpectedly. They’re here today and gone tomorrow. There’s things I wanted to say, wish I would have said and long for just one more hug and smile from them. I know they’re in the most incredible spirit realm. I know and trust they are happy and calm and with all the goodness that are other pure souls, but if it’s taught me anything it’s to cherish those souls when they are around me in this plane. To hug and cherish every good time, and love deeply. 4. Green veggies are for all. It doesn’t seem like that long ago that I lived off of morning sugary cereals with hormone filled cow milk, lunched on white bread (sugar) with a cold cut meat and some cheese and dined on the only proper meal of my day which was my mom’s home cooked dinners of usually steak, potatoes and rice, avoiding salads at all costs. My life has done a complete backflip, or would this be considered a front flip… I have educated myself and continue to do so (because really there’s just so much to learn) on the importance of food, the importance of real ingredients and the importance of eating locally grown produce. I’ve stopped eating land and air animals and my health has become of clear importance in my life. 5. Love fully and deeply. There was once a quote I read that said something like “The one that loves less has more power in a relationship.” When I was young and was just getting over the biggest heart break of my teenage years I believed these words. I thought they made perfect sense. If I love less I’ll be protected, if I love less, I can’t be hurt. But this, young me, was foolish and wrong and thankfully, you understood what true, real, and passionate love was all about and power was never a part of that homemade description. I have learned of love in these 27 years, and I will continue to learn from it when new milestones occur, and when there are little ones to love, but for now I am grateful for the lessons of love I have had so far, for I love fully, and deeply and with no holding back because there is no fear of ever being hurt. You have to believe it, because at the end of the day, no one else belief matters quite like yours. So trust yourself. This one took a while to learn. 7. Try something before you say you don’t like it. This was not true of me in the past when it came to food that’s for sure, but when it comes to life, heck yes. I’m a trier. I try a bit of everything, and sometimes I get really passionate about something new and give it my all. Sometimes I burn out and lose focus, and other times I don’t. This is how you learn more about yourself, about what you’re like and about what you can do! Try everything! Say yes to the opportunity. Figure it out along the way! 8. Done is better than perfect. Accomplishing something is better than quitting because you don’t feel like it will turn out quite how you want it to. I’ve been guilty of this so so so many times in the past. Why write that novel if I don’t think I’m very good? Why be a coach when I don’t have a facebook fan page. It doesn’t matter, you do it because you had told yourself you were going to, and breaking a promise to yourself just tells the universe you are not that important. 9. It’s all in the process. The destination is pretty freaking cool. But the journey you take to getting there is where the story lies, it’s where the meat of the lesson is in. You want to be something, do something, achieve something? Do the work, make hard decisions, wake up every day with full commitment and intention. 11. Knowing WHY is the most important piece of knowledge. It doesn’t matter how you are going to do something or when, doesn’t even matter what you are going to do if you don’t know why you are doing it. When your why is strong you will not fail, you will not quit and you will give it your all. 12. I have a lot more to give of myself, and to be. I am young, although my mind fights me on that one and whispers how close 3-0 truly is. Truthfully, I am excited for what is to come and how my role as a woman will change over the next few years. I am in love with the idea that I will become someone else, a new version of me when I become a mother and am looking forward to all that I will gain from it. 13. Focus on what you can control, and only that. I’m a planner, and plans are always written down, on paper, in ink. Not erasable, and crystal clear. Life though doesn’t always get the memo, and sad things happen that surprise you by morphing into wonderful lessons on patience and strength. 14. Lighten up, and don’t take yourself so seriously. It’s ok to be silly, it’s ok to joke around and have a funny conversation just because and not because it’s tied to a specific goal. Breathe, live and enjoy. 15. Every person has a story. It’s complicated and raw, it has hardships and it has beauty. It seems easy to some, and impossible to others. But they are all real and they are all special and they all have meaning. 16. The world will only change when you do. Complaining and sharing depressing news about the state of the world on social media won’t get us anywhere. If there’s something you want changed, you want people to be kinder, more giving, more self less, more trustworthy, then you have to start with yourself. Change yourself and you can change the world. 17. Finances are something to get educated about. 18. Vacation and let loose. Take time for yourself and your relationship. Disconnect and unwind. Do nothing for 3 days and lounge in your PJs, no matter the style of vacationing you prefer. Make the time, give it importance because these are moments our soul needs to reset. A stranger on the street, someone passing you on the hallway. Smiling makes people’s lives better. They can save lives, they can make invisible people seen. They have power we do not understand. Be a sponge, learn from everyone, gather inspiration from the world. Teach yourself about life. 21. Gratefulness is key in attracting good things in life. The law of attraction, have you heard of it? Well did you know it works just as well if we complain and think negative thoughts? We’ll just have more of that, which nobody wants. Instead we need to focus on being grateful for all we have, every day, every moment. When we practice this every day we will see the things we are grateful for will multiply! 22 People deserve a second chance. People have wronged me, they’ve been cruel, and horrible. They could be family, they could be friends, either way. Bless and release. If they care enough to try again, to rekindle what was there, and you feel safe in doing so, people deserve another chance. You may be surprised with who they’ve become! 23. I will never escape stress. Stress is felt by everyone in many different ways, and accepting that it’s something that will morph and grow with me is something I have learned to understand. Management of stress and understanding how it manifests are all topics to learn more about and knowing that just because you don’t ‘feel’ stressed doesn’t mean you aren’t. Sometimes it is reflected in a weak body part or muscle. 24. Your passion is everything. Find what you are passionate about and when you find a way to do that every day, the amount of happiness and joy it will bring into your life will be incredible and noticed by all. 25. Minimalism is the key to many issues. Buy less things, accumulate less things, spend money on experiences. Collect memories. Live freely. 26. Family is more than blood. Sometimes you find family along the way. I need only be who I want to be. There is just one person who can be me, and it’s me. I am intelligent, honest and caring. I am my friend, and I am enough. 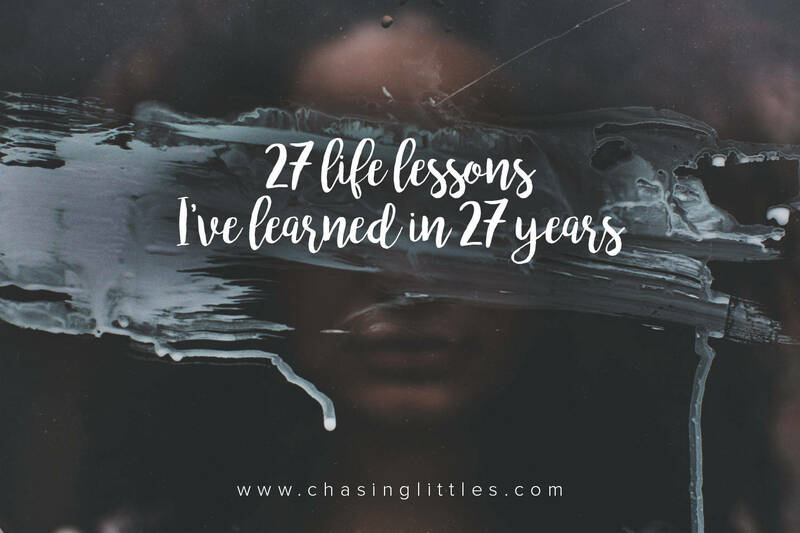 27 Life lessons. In 27 years. If I live to be 100, I’ll have learned 73 more. Ooof, long way to go! So much to experience, so much to learn. You Failed, Now Let’s Move On. Previous Post You Failed, Now Let’s Move On. Love the first point about your energy, and trying to be positive. It’s something I struggle with and am working on now. I’m currently reading “The Universe Has Your Back” – it’s a good read if you’re looking for something on this topic! That sounds like a book i’d enjoy, thanks for the heads up! These are great words and lessons to live by no matter what age! Thanks so much! I am happy you liked the post! These are amazing tips. These are all SO relevant, and still so many more life lessons to learn. Living and learning! Thanks for sharing. Thanks Abbey! Many more to come!!! GREAT life lessons! My favorite = don’t take life too seriously. I hate when people get angry and so serious and argue. CALM DOWN. Life is not that ridiculous. It is what it is, and just make light of every situation, regardless of what’s going on. Completely agree! Thanks for reading!! This is a wonderful one and so very true. the importance of moving your body has been more important lately than ever before! I love this! YES to green veggies haha. And I’ve been trying to take more intentional vacations, too! Yes to vacationing! even if it’s around the corner or just an hour away. Anywhere can lead to adventure! What a fun post, with so many valid points. Many things I didn’t’ learn until my 30’s, so you are well ahead of me, haha! My 35th is coming up next week, perhaps I’ll make a list myself. That’d be great! please share the link when you post it! Id love to read it!! number 3, 6 and 10 yes. Fun post to do! get get pretty lengthy! maybe when I turn 40 i’ll drop the paragraphs and stick with just the one liners haha. 2, 6, 15 and 24! Those are great life lessons to have already learned at 27! thanks girl! I hope i can keep adding to it as the years go on!! You’ve learned some good lessons in only 27 years. You’ll be adding some more great ones as time goes on. Thanks so much! I can’t wait to keep learning. for 27, you are so wise! i am turning 3-0 soon and trying to implement so many of these points in my life. Take a compliment. Yes! Why is it so hard for so many?